Lead is the dominant material used in x-ray and radiation shielding applications. Lead shielding refers to the use of lead to shield you from scatter radiation. 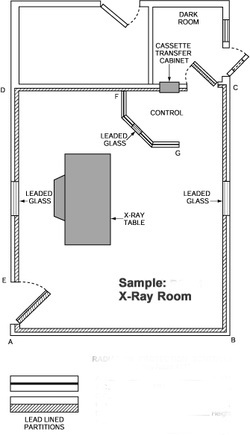 Lead and some of its alloys are generally the most cost effective radiation shielding materials to protect against the effects of gamma rays and x-rays. The properties of lead shielding which make it an excellent shielding material are its density, high atomic number, high level of stability, ease of fabrication, high degree of flexibility in application, and its availability. When protection is required there is no substitute for skill and experience. PXR has been supplying radiation shielding for nearly 30 years. We are capable of supplying shielding to customer specification. This allows for greater flexibility in the design for our customers. We work in partnership with you to develop appropriate designs to make assessments on the proper shielding required. During the construction stage of your facility, we will work with you to lead shield the walls of your x-ray room prior to construction completion. We supply a full line of radiation shielding products. They include doors (solid core wood, lead lined, and steel strapped), door frames, lead lined gypsum board and plywood, leaded glass and acrylic, lead sheets, lead lined frames for doors, windows, pass boxes, and many other lead products. We are also capable of lead shielding doors supplied by our customers. PXR uses only the finest quality materials and exercises the best quality control possible. We are able to set up room for new building or install in existing rooms.